Victorian Steamer Upright Piano Lamp Antique Brass and Mahogany Bronze is rated 0.00 out of 5 based on 0 ratings. Perfect for Console Sized Pianos and/or Medium Sized Upright Pianos! Unique design of marble, antique brass, and mahogany bronze design accents! This lamp is uniquely suited to lighting from behind and slightly above the music desk - so mid-sized uprights and console pianos will be well served by this lamp. The 5" square base sits on the top of the piano, and the 12.5" curved arms can be adjusted forward and lower to help you find the best angle to position the shade above your music. Made in Vermont, with a handsome square of black and tan marble creating a unique and substantial base for this sturdy lamp (natural marble has color variations from piece to piece). 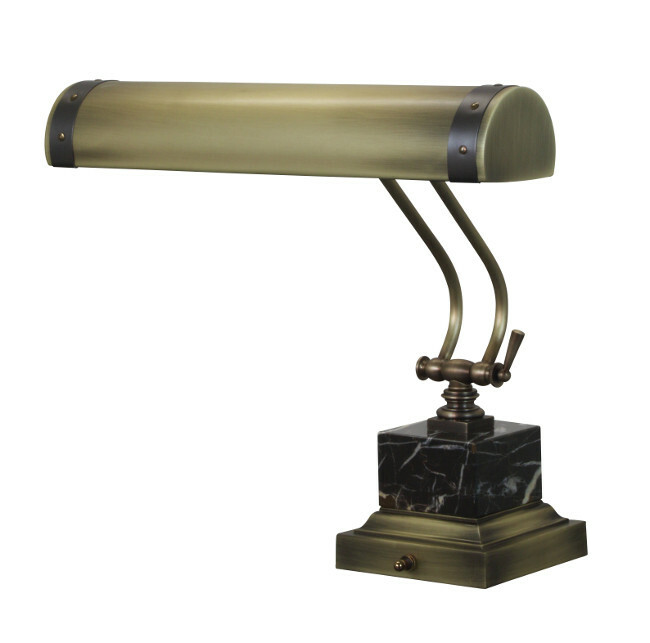 While the lamp is made of finely finished antique brass, the edges of the shade are decorated with a contrasting mahogany bronze band and rivet accent found in Victorian era Steamer Trunks.